While I’ve been designing magic & illusions professionally for a number of years, but a pet project on mine has been designing curtain or cloth drop systems for my shows and illusions. I’ve working on various methods and systems, depending on the needs of the particular prop or situation. My “Shadow Appearance” illusion uses a self-contained cloth drop system and I have also released a professional manual Kabuki Drop system that is mounted onto flying or lighting bars/ trussing. In particular, for magic & illusion shows, Kabuki Drops can be used in different ways to create different visual effects and add a “wow” moment. The most obvious way to use the Kabuki Drop is as a direct reveal when you want it in your show. It could be at the top of your show to start the show. In which case, you might have your logo printed or silkscreened on the curtain. You could also have the Kabuki Curtain covering a large illusion or finale set piece and drop the curtain only when you perform the effect. 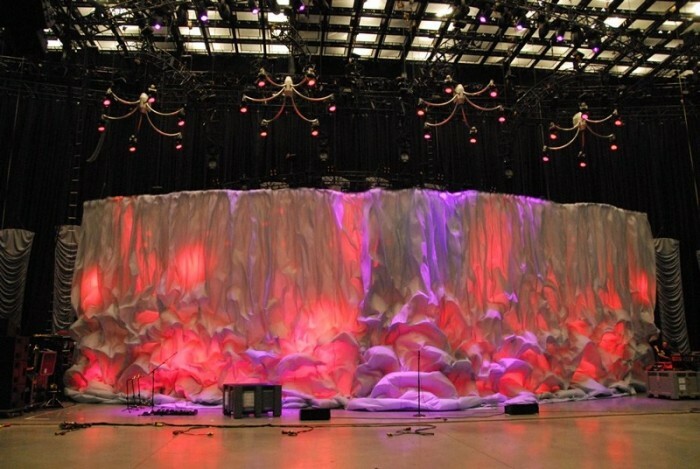 At the top of your show, a white curtain (cloth) hangs down and covers the front of the stage. An introductory teaser video is seen via projection on the curtain to introduce you. At the end of the video, the curtain drops revealing you in stage and transitions to your first routine, act or illusion. Check out this video from a Volkswagen launch. While not exactly a performance, it gives you an idea of how a cool animation sequence can be integrated with a Kabuki Drop. While not an illusion, you can see how the band One Republic uses this concept to great effect for the opening of their show. Here is an idea that you can use. In sync with appropriate music, you literally walk slowly from behind the light, step over and walk forward downstage (towards the curtain). The audience will see your silhouette “magically” appear and grow larger. The curtain drops and you make your “appearance” and go into your first act, routine or illusion. A double drop can be used to create an awesome “magicial” appearance. Check out this video from Brett Daniels’ old show. The effect in question is at the top of the video. Nuff said! This uses a cloth “hammock” that holds all the confetti. A Kabuki Drop system releases one long end of the cloth “hammock” that allows the confetti to drop to the stage floor. You can use the glitter drop as a finale effect, to enhance a visual effect, to mask a vanish or execute a visual costume change. The Kabuki Drop as a holding device can also be used to drop other items like balloons, ping pong balls and anvils… ok, maybe not anvils. This uses a double drop in conjunction with an illusion utility such as an illusion deceptive base or Black Art Table. There are several resources to learn about Kabuki Drops and how to make them. Check out www.MagicKabukiDrop.com for the ultimate resource on the subject and request for the free download “How to Make a $50 Kabuki Drop”. My book “Ultimate Kabuki Drop Resource” includes six original designs for Kabuki Drops that are easy and inexpensive to build. There are different plans for different needs & venues with original ideas and design elements. I wanted to know if the single drop kabuki drop system includes the matal pole to hang it on? And if not how do I get it? What specifics do I need to pay attention when I find a way to get it? And I also wanted to know how much will it cost to ship to Israel? Hi, no it does not. It is just the system. Most (if not all systems) all mount on existing lighting fly bars or truss. For comprehensive information on Kabuki Drops and systems, check out the free resource: http://www.magickabukidrop.com. Thanks!